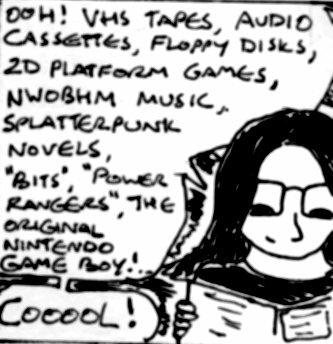 In case anyone is curious, “NWOBHM” stands for ‘New Wave of British Heavy Metal’ (eg: Iron Maiden, Motorhead and Judas Priest) and “Bits” was an excellent late 1990s/early 2000s TV show about videogames presented by Emily Booth, Aleks Krotoski and Emily Newton Dunn. Most people get nostalgic abut something or other, it’s pretty much a fact of life. It’s also an absolute goldmine when it comes to writing stories and comics for several reasons – namely that it can be a good way to get past creative blocks, it can appeal to your audience and it can be shown in a different way too. Sometimes it works best as the central focus of a story or comic and sometimes it works best as just a background detail – this probably varies from story to story. -There’s personal nostalgia about parts of your own life. Personal nostalgia is probably the easiest to write about in practical terms, although you have to write about it in a way which other people can understand. But all this basically means is that you just have to describe things a bit more and don’t take it for granted that your readers will know what you’re talking about. -There’s nostalgia about things (eg: films/food/drinks/books/TV shows/games/ technology/shops/comics etc..) which have either changed, are no longer made or no longer exist. Nostalgia about things is slightly more complicated to write about – since if you want to focus on things in a lot of detail in your story or comic, then you might possibly have to change some details in order to to avoid copyright/trademark issues (I’m not a lawyer or an expert on this subject – but things like quoting song lyrics usually aren’t a good idea ). -There’s the more stylised cultural types of nostalgia – like “80s-themed” things etc… I’m personally still waiting for the 90s to become a major source of cultural nostalgia, since I actually remember some of this decade. Although I’ll probably freak out when I see 00s nostalgia in the mainstream media! Anyway, writing about stylised cultural nostalgia is also fairly easy, although it can quickly become cliched – since quite a lot of people have probably already written about it before. But, on the plus side, you’re probably guaranteed a wider audience if you write about stylised cultural nostalgia. When you’re writing your story or comic, it’s totally up to you whether you just focus on one of these or all of them. Ideally, you should probably try to include a mixture of them in your stories and comics – since they’re all basically parts of the same thing and they all fit together quite well (eg: stylised cultural nostalgia is usually made out of lots of individual things from a particular decade and most people have their own individual memories related to these things). So why should I add nostalgia to my story/comic? As I mentioned earlier, there are three reasons why it’s a good idea to add at least a small amount of nostalgia to your story or comic. Obviously, this probably doesn’t apply directly to some genres (eg: fantasy stories set in a different world, distant-future sci-fi etc…). Although if you can come up with some fictitious types of nostalgia in your fantasy or sci-fi stories, then this can be really interesting (for example: if the starship pilot in your sci-fi comic has a habit of reminiscing about the 2230s or whatever). 1) It’s a great way of getting past creative blocks: If you’re anything like me, then nostalgic things often seem to be innately fascinating. They fill you with a warm glow and they’re something which you can probably deliver a lecture about if someone asked you to. When you’ve got writer’s block or artist’s block, then this is an extremely good thing. I’ve written before about geeking out about your stories and this is definitely one way to jump-start this entire process. If you can geek out about something, then you’re in a much better position to write about it and you probably already feel quite fascinated and inspired about it too. Plus, writing about nostalgia can evoke a lot of emotions in you too – this is an essential part of the creative process. Regardless of whether it’s funny, bittersweet, cathartic, exciting or just good fun when you’re writing it, then you’ll probably feel a lot more inspired than if you just feel neutral or bored when you are writing. 2) It appeals to your audience: This is a slightly complicated one, but if your audience is nostalgic about something and they see that you’ve written a comic or a story about it, then they’re probably going to be interested in it. However, this is something of a double-edged sword, since a good portion of your audience may either not remember something or just not be interested in something (eg: if you’re writing a story about old videogames, then people who aren’t into games might not be that interested in it). On the other hand, many people are fascinated by history – particularly the history of the times just before they were born or when they were extremely young (and only saw it from a child’s perspective). There usually seems to be a twenty-year gap when it comes to this. For example, there was apparently a lot of 1960s nostalgia in the 1980s according to someone I talked to a few years ago. There was a fair amount of 1980s nostalgia in the 2000s (The BBC’s excellent “Ashes To Ashes” TV series springs to mind for starters…). As I said earlier, I’m still waiting for 90s nostalgia to become a major cultural thing – but it’ll probably happen sometime this decade. Anyway, either focusing on nostalgia or adding some of it to your story means that you automatically have something in common with part of your audience. If you have something in common with your audience, then they’re probably slightly more likely to be interested in your story because it helps them to look at their own memories. 3) You can show things in a different way: Although I mentioned that people are fascinated by history a couple of paragraphs ago, nostalgia is not history! Yes, it’s usually heavily influenced by history, but it’s actually a rose-tinted, distorted, stylised and subjective view of the past. As a writer, you can have a lot of fun with this. You can either go down the more cynical road of total historical accuracy and shatter a lot of illusions people have about a particular period in time. This requires a lot of research, but it can be absolutely fascinating to read when it’s done well. Plus, it can be good for more political and satirical stories too [I’ll have to write an article about politics and fiction sometime]. A classic example of this are stories which go back to the “good old days” which conservatives like to talk about and point out that they actually weren’t really that good for quite a few groups of people. An excellent musical example of this is probably a song by Suzanne Vega called “Last Year’s Troubles“. On the other hand, you can go in completely the opposite direction to this and make your story even more stylised than the nostalgia already is. You can change things, you can add a lot more atmosphere, you can take things to their logical extreme (or maybe even to their illogical extreme – eg: Steampunk fiction). You can come up with a clearly ficticious (it’s probably not a good idea to present it as factual…) better version of the “good old days” where things actually were good for everyone (the “Star Trek: Deep Space Nine” season seven episode ‘Badda Bing, Badda Bang‘ has an interesting discussion about this whole subject). You can add vampires, magic, sorcery, aliens, time travel, implausible meetings between historical figures etc… whatever. If you take this approach, then your imagination is the only limit and it is really fun to write. This approach is also good if you don’t actually remember and/or haven’t lived through the time in question too. For example, I’m fascinated by the 1980s, but I was actually too young during the 80s to actually remember any of it . So, when I write stories or comics which are set in the 80s – I usually just take the stylised cultural nostalgia about it and, basically, just play with it. Have fun. This entry was posted in Comics, Writing and tagged creativity, Nostalgia, writing.